Packed with excitement and adventure. It's a must for any youngster who loves vehicles. Packed with excitement and adventure. It’s a must for any youngster who loves vehicles. Beyond that, there’s also plenty of charm and whimsy. Your first car is always the best. And your first trip is unforgettable – even when it doesn’t go exactly to plan. A boy goes for a drive with his little brother in his new/old car and has a tremendous adventure on the way. 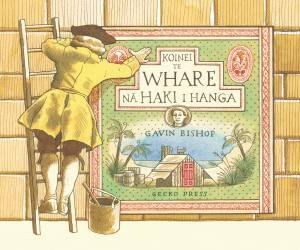 I loved this book because it had pictures of signs through it and you never new what was going to happen next. It was still great even after reading it lots of times. The pictures were really good too. I love this book as does my 3.5 yo daughter so despite being about cars it’s a great book for any preschooler, boy or girl,keen on adventure and vehicles. 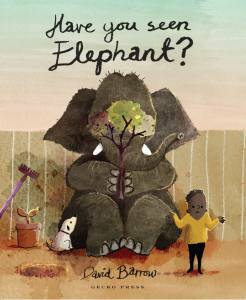 The illustrations are interesting and different and the story that eventuates keeps adults guessing as well as children. There are a number of themes in the book: perseverance in a project; the joy of shared time working on a project between adult and child; the bonds between siblings and how they can push each other into new adventures or when the going gets tough, each of them can help out to get them back home safely; the challenge of developing independence and all with little in the way of words. 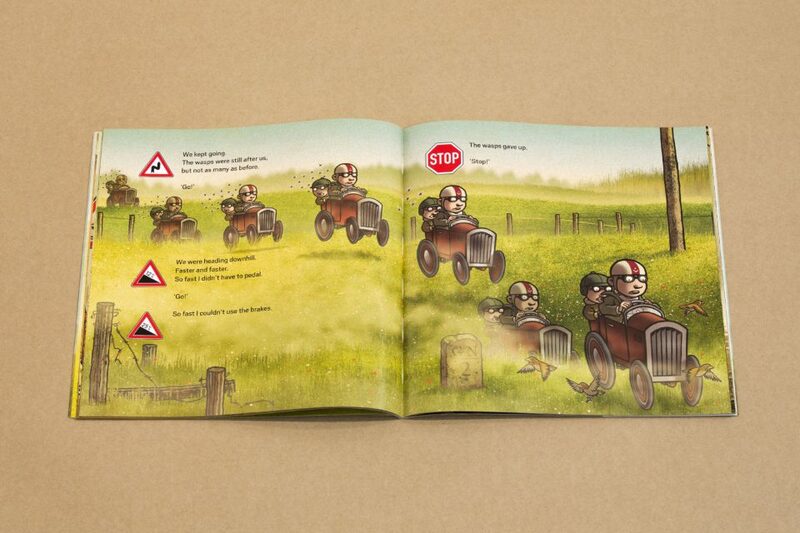 A key feature of this book is the use of road signs to say what is happening and this is such a fantastic way to teach children what signs mean in a straightforward and fun way. 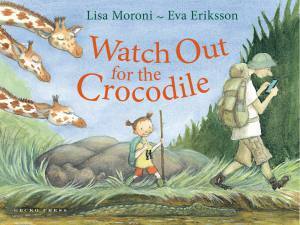 It’s makes for great interactive moments to point to a sign and ask your little reader what it means so that they can also match the sign to the narrative that is being shown in the pictures. Definitely not run of the mill. 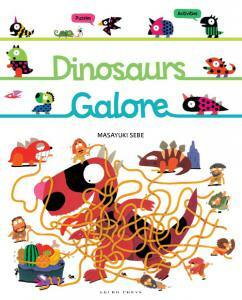 What a delight this book is – from cover to cover its illustrations are vivid and detailed. 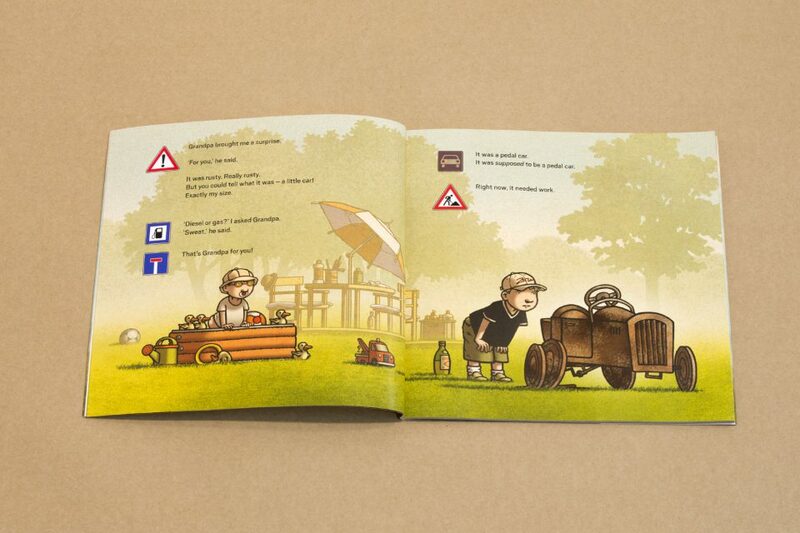 The storyline is very typical of little boys and their pedal car, their adventures and their dreams. The author has taken himself back to his happy childhood obviously, his adventures still vivid (or well imagined) and the story could relate to any two little boys even today. 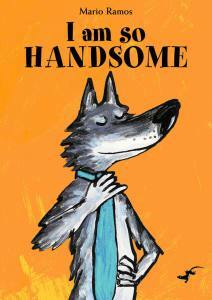 A must-buy for anyone who reads to little boys. 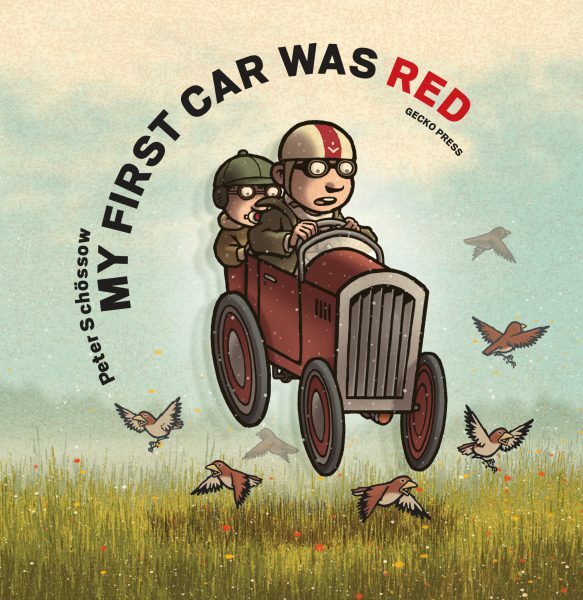 My First Car Was Red is a really unique picture book by German author and illustrator Peter Schossow. 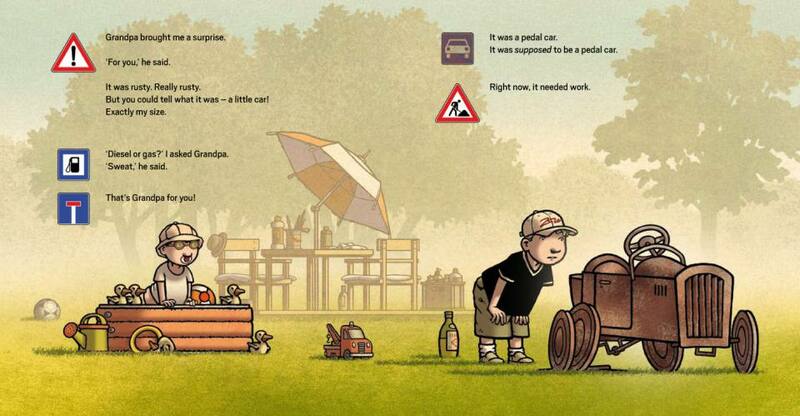 It’s the story of a boy who is given an old, rusty pedal car by his grandfather. Together, they repair the car and give it a new coat of shiny red paint. The boy wants to take it out for a spin straight away but his grandfather takes him off to the Driving School to have lessons first. When he finally gets to go off on his own his little brother wants to join him, and this is the start of a wild ride uphill and downhill, through fields, spooky forests and tunnels, nearly hitting pigs, and being chased by wasps. 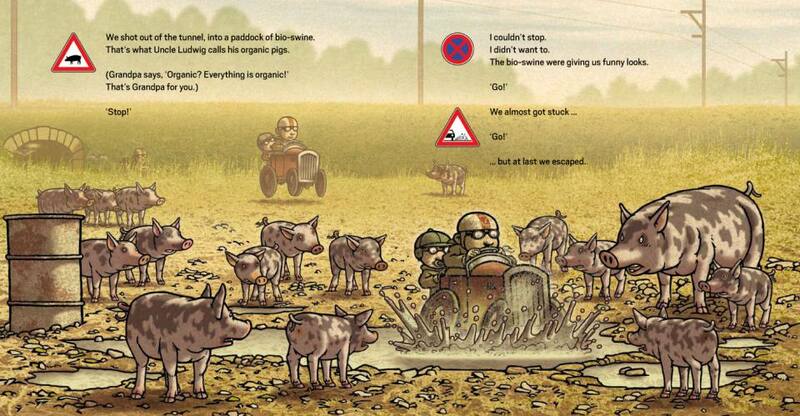 The thing that really makes this book unique are the road signs throughout the book. Each of the signs match up with the story perfectly (a speed bump sign for the bumpy field, a rockfall sign when they reach a cliff) and the story could almost be told without words, just the road signs. 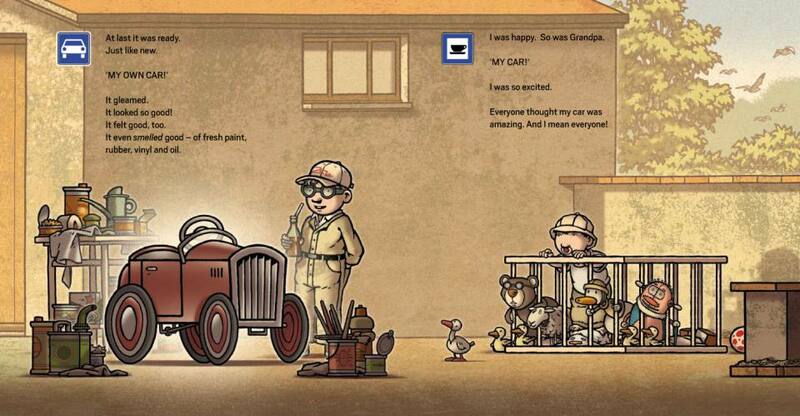 My First Car Was Red is a story to be read again and again, finding new things in the illustrations each time.